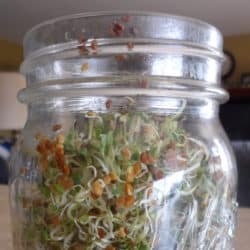 July 12, 2016 0 comments on "How to Grow Sprouts in a Jar"
If you have never grown your own sprouts, then you are missing out. It is ALMOST as fun as re-growing green onions. What’s great about them is you can grow them right on your kitchen counter. To grow sprouts in a jar, you will need to make a trip to your local health food store. I checked out the health food sections of several grocery stores, but couldn’t find them anywhere but at the actual health food store. You can buy a variety of seeds to sprout. They look just like seeds you would plant in the garden. You can get alfalfa seeds, radish sprout seeds, broccoli sprout seeds, and I think a few others. I decided to try alfalfa seeds. A big package of them was less than $3. Place approximately 2 tbsp. seeds in a clean pint sized canning jar. You could use another type of jar if you can use a rubberband or something to hold the cheesecloth on top of the jar. The ring that comes with the canning jar works really well. in place of the cheesecloth you can also use these inexpensive sprouting lids you can order online from Amazon. They screw right on top of your canning jar and are re-usable. Fill the jar approximately half full with water and place a small piece of cheesecloth on top of the jar. Place the ring on the jar to hold the cheesecloth in place. If you can’t find any cheesecloth you can also use a nylon stocking. Some people have also used metal screening like you would use as a splatter screen for a frying pan. You can find these at the Dollar Store and cut them down to size. You just need to be able to drain water through it without the seeds coming out. Soak the seeds in the water overnight and then in the morning, turn the jar over, letting all the water drain out. Set the jar on its side on the counter and let it set. The next day, fill the jar with water again, swish the water around in the jar to rinse off the seeds and then drain the water again. Keep repeating this process until the seeds sprout. The reason you are rinsing them is that germs and bacteria can grow if you just let them set for too long. What is so amazing about these seeds is how fast they sprout. Within a day you will see tiny shoots coming out of the seeds. Within FOUR days you will have a jar full of sprouts, ready to eat and enjoy. After the sprouts are done, set the jar in a sunny window. The sunlight will help the sprouts turn a richer color green. These sprouts are great on salads or in tuna sandwiches. I ate a couple handfuls right of the jar. Yum!